When an investigation is required, you need to make sure it’s done right. Conduct your investigations using a consistent process that results in thorough, transparent, and fair fact-finding. Our proprietary three-step methodology guides you through a standard yet flexible process based on best practices — encouraging employee trust and cooperation, while improving accuracy and defensibility. Built-in protocols and interview guides equip your investigators to ask the right people the right questions, protect attorney-client privilege when required, and help your organization remain compliant. Build trust and demonstrate your company's commitment to employees with a standardized process that ensures employee issues will be handled fairly and efficiently. Don't leave what's said in interviews up to chance. Guide your investigators with standardized templates. Make sure all parties are informed at every step of the process by keeping complete records of all communications. Remain compliant and guard against retaliation by managing handoffs between investigators and decision-makers. Take the guesswork out of investigations. Our software guides investigators through each step of the process. Ready to manage employee relations the right way? 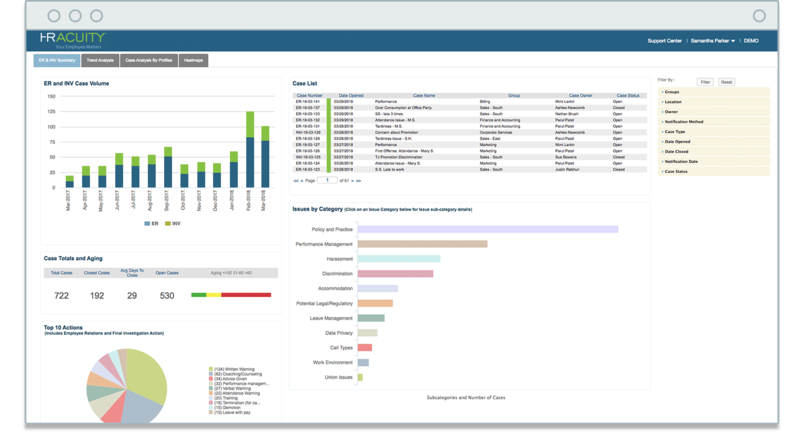 Schedule a demo to learn how HR Acuity can equip your organization with a better way to document, investigate, and analyze employee issues.